BRAND NEW SUPER NINTENDO CLASSIC MINI. COMES WITH 2 X CONTROLLERS. THE UNITS ARE 100% NEW AS THE MODIFICATION IS DONE USING MY OWN ACCESSORIES! Enabled Built-In SNES Classic Games. The Legend of Zelda: A Link to the Past. Street Fighter II Turbo: Hyper Fighting. Super Mario RPG: Legend of the Seven Stars. CONTRA III THE ALIEN WARS. Adventures of Batman & Robin, The. Adventures of Rocky and Bullwinkle and Friends, The. S Road to the Top. Arcade's Greatest Hits - The Atari Collection 1. Arkanoid - Doh It Again. Ballz 3D - Fighting at Its Ballziest. Barkley Shut Up and Jam! Beethoven - The Ultimate Canine Caper! Best of the Best - Championship Karate. Bill Laimbeer's Combat Basketball. BlaZeon - The Bio-Cyborg Challenge. Bulls vs Blazers and the NBA Playoffs. Champions - World Class Soccer. Chester Cheetah - Too Cool to Fool. Chester Cheetah - Wild Wild Quest. Choplifter III - Rescue & Survive. Daffy Duck - The Marvin Missions. David Crane's Amazing Tennis. Death and Return of Superman, The. Desert Strike - Return to the Gulf. Donkey Kong Country 2 - Diddy's Kong Quest. Donkey Kong Country 3 - Dixie Kong's Double Trouble! Duel, The - Test Drive II. F1 ROC - Race of Champions. Final Fantasy - Mystic Quest. Final Fantasy VI - The Eternal Crystals VerX. Flashback - The Quest for Identity. Garry Kitchen's Super Battletank - War in the Gulf. George Foreman's KO Boxing. GunForce - Battle Fire Engulfed Terror Island. Home Alone 2 - Lost in New York. Hunt for Red October, The. Inindo - Way of the Ninja. Itchy & Scratchy Game, The. Tolkien's The Lord of the Rings - Volume 1. Jetsons, The - Invasion of the Planet Pirates. Jimmy Connors Pro Tennis Tour. Joe & Mac 2 - Lost in the Tropics. Kirby's Dream Land 3. Krusty's Super Fun House. Legend of the Mystical Ninja, The. Lufia II - Rise of the Sinistrals. Magical Quest Starring Mickey Mouse, The. Math Blaster - Episode 1. Miracle Piano Teaching System, The. Nobunaga's Ambition - Lord of Darkness. Ogre Battle - The March of the Black Queen. Operation Europe - Path to Victory 1939-45. Phalanx - The Enforce Fighter A-144. Power Piggs of the Dark Age. Power Rangers Zeo - Battle Racers. Ren & Stimpy Show, The - Buckeroos! Ren & Stimpy Show, The - Fire Dogs. Rex Ronan - Experimental Surgeon. Road Runner's Death Valley Rally. Romance of the Three Kingdoms II. R-Type III - The Third Lightning. Shanghai II - Dragon's Eye. SimEarth - The Living Planet. Simpsons, The - Bart's Nightmare. Skuljagger - Revolt of the Westicans. Snow White in Happily Ever After. Space Football - One on One. Space Invaders - The Original Game. Spider-Man-X-Men - Arcade's Revenge. Star Trek - Deep Space Nine - Crossroads of Time. Star Trek - Starfleet Academy - Starship Bridge Simulator. Sterling Sharpe - End 2 End. Super Aquatic Games Starring the Aquabats, The. Super Baseball Simulator 1.000. Super Conflict - The Mideast. Super Noah's Ark 3D. Super Pinball - Behind the Mask. Super Star Wars - Return of the Jedi. Super Star Wars - The Empire Strikes Back. Tecmo Secret of the Stars. Teenage Mutant Ninja Turtles IV - Turtles in Time. Tiny Toon Adventures - Buster Busts Loose! Tommy Moe's Winter Extreme - Skiing and Snowboarding. Tony Meola's Sidekicks Soccer. Ultima - Runes of Virtue II. Ultima VII - The Black Gate. Ultraman - Towards the Future. Utopia - The Creation of a Nation. War 3010 - The Revolution. Wheel of Fortune - Deluxe Edition. Wings 2 - Aces High. World Soccer 94 - Road to Glory. Ys III - Wanderers from Ys. Orders made on Saturday or Sunday will be dispatched on Monday (excludes bank holidays). Items generally arrive within 3-5 days in the EU and 7-10 days for non-EU destinations. NOTE: SERIAL NUMBERS ARE ALWAYS RECORDED BEFORE DISPATCH. 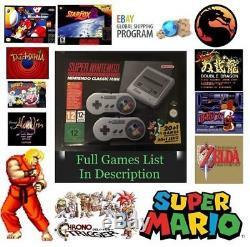 The item "Brand New SNES Mini Console 400+ GAMES Super Nintendo Classic Trusted Seller" is in sale since Saturday, December 1, 2018. This item is in the category "Video Games & Consoles\Video Game Consoles". The seller is "lightning-deals4u" and is located in Northampton. This item can be shipped to United Kingdom, Austria, Belgium, Bulgaria, Croatia, Cyprus, Czech republic, Estonia, Finland, France, Germany, Hungary, Ireland, Italy, Latvia, Lithuania, Luxembourg, Malta, Netherlands, Poland, Romania, Slovakia, Slovenia, Sweden, Australia, United States, Canada, Japan, New Zealand, China, Israel, Hong Kong, Norway, Indonesia, Malaysia, Singapore, South Korea, Switzerland, Taiwan, Thailand, Chile.